Asian Men's U23 Volleyball Championship 2015: Full Schedule, Updates, Standings, Results, Scores - Balita Boss! 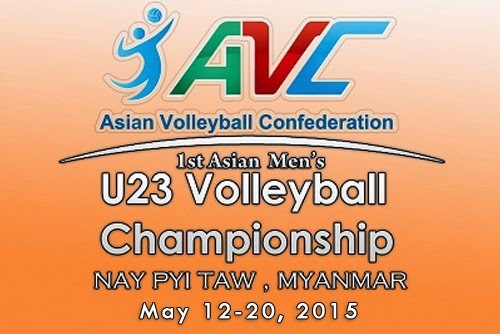 The 2015 Asian Under-23 Men’s Volleyball Championship is scheduled to be held on May 12 to 20, 2015 at the Wunna Theikdi Sports Complex in Nay Pyi Taw, Myanmar. The 1st U23 Asian Men's Volleyball Championship will also act as the qualifying event for the 2015 FIVB Men's U23 Volleyball World Championship to be played in Dubai, United Arab Emirates. The top two teams from this tournament will earn a spot at the second edition of FIVB U23 World Championship. All times are Myanmar Standard Time (UTC+06:30). The first and third placed teams of each Preliminary Round pools will be seed in Quarterfinals and 9th–16th Quarterfinals respectively. The second and fourth placed teams of each Preliminary Round pools will be drawn to match the first and third placed teams respectively. The teams in same pool in Preliminary Round will not play each other.